Very frequently lost when the disk drive for the Spectrum +3 is opened for servicing - a tiny but crucial part of the drive - it won't save programs without it ! 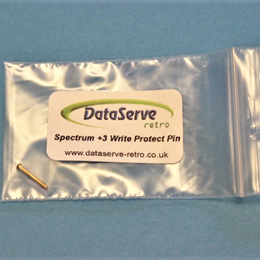 this pin is required in the original EME-156 drives fitted as standard in the Spectrum +3. It is possible that your drive may have been changed over time for a different drive model number (most often an EME-155) - if so, this pin is NOT required.